Little Cruz Beckham busted out a break dance -- while Mariah and Miley rocked the stage! The 2008 Teen Choice Awards brought out the inner beach bums of big winners The Jonas Brothers and the "Gossip Girl" crew, each nabbing six surfboard awards. "Extra" caught up with hostess Miley Cyrus -- who admitted she really is a bad girl after all! "Today was my first rehearsal -- first time I looked at the script," said the "Hannah Montana" star. "I'm a bad host! I'm bad. I didn't practice it at all." Dad-to-be Jerry O'Connell also dished baby news to "Extra" about the impending arrival of his twin girls. 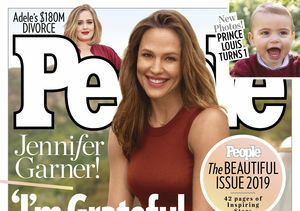 "We already have names picked out -- and I'm giving 'Extra' the exclusive," joked Jerry, "Mary-Kate and Ashley." Catch your favorite celebs when the Teen Choice Awards airs tonight on FOX! 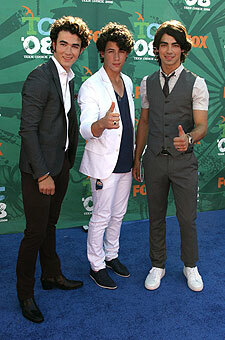 Click on an image to view the 2008 TEEN CHOICE AWARDS photo gallery!